Leonardo DiCaprio has been granted a restraining order against a woman who believes she is his wife and is carrying his child — called Jesus. The “Titanic” and “Inception” star said in documents filed with Los Angeles Superior Court this week that he was frightened of the “delusional” woman and felt his personal safety was in jeopardy. He also asserted that “he” was the one carrying the baby Jesus and that the baby was developing normally in the top of his cranium. His lawyer submitted a number of hand-written letters from the woman, named as Livia Bistriceanu, to DiCaprio. “I know your head is gigantic,” read the letter written in the childish scrawl commonly found amongst people who have restraining orders against them. 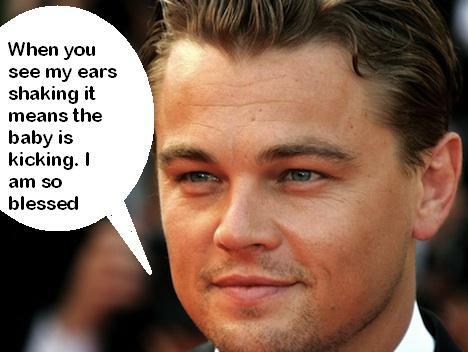 DiCaprio’s obstetrician scoffed at this negativity. Other doctors question how DiCaprio will delivery the baby. “While there is little doubt that Mr. DiCaprio’s head contains a developing fetus, we question how he will deliver the child,” said a team of doctors and midwives who prefer to remain anonymous. DiCaprio, who had previously avoided the subject because of the ongoing criminal investigation, agreed to answer these hard questions. George Clooney clutched Leo’s hand as the Titanic star spilled his true feelings. “I have hired Dr. G Medical Examiner to remove the baby Jesus as soon as I start getting contractions.” said DiCaprio as he sat poolside withClooney and a statue of Randolph Scott. 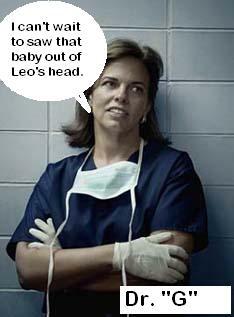 Dr Janet Garavaglia, or “Dr.G” as she is known to Discovery Channel viewers is ready willing and able. The baby Jesus is expected in November and women around the world can see that DiCaprio is really starting to show. He has already received gifts of maternity hats and so far he has about two thousand.